This is wonderful. Recently two trainees from Majumder lab were interviewed by the Peer-reviewed journal “Biology Open” for their inspiration to conduct research. This is an immense honor to authors and international recognition. Congratulations to Kingsley and Sujit !!!!! 2. Could a simple blood test be able to detect breast cancer? 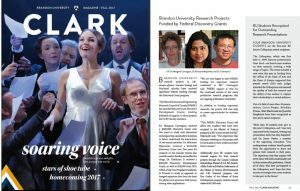 Brandon University Magazine, Fall edition 2017 profiling Dr. Majumder’s success story. Brandon Sun. September 21, News about NSERC discovery grant in Brandon Sun “BU faculty nets prestigious national research fund”. COX-2 induced breast cancer story has been selected for the Cover Page of journal Stem Cells, The International Journal of Cell Differentiation and Proliferation, Wiley, Volume 34, Issue 6, September 2016. Canadian Stem Cell Foundation summer newsletter “Cellection” interview. Cancer stem cells: What is new? Peeyush K. Lala and Mousumi Majumder explain how cancer cells become immortal in the 7th installment of the Hallmarks of Cancer series. Published in The Londoner (July 23rd, page 18). Global Medical Discovery highlighted ‘The role of CCL21/CCR7 chemokine axis in breast cancer-induced lymphangiogenesis’ by Tutunea-Fatan E, Majumder M, Xin X, Lala PK, Molecular Cancer. Mammary Cell News highlighted ‘COX-2 Elevates Oncogenic miR-526b in Breast Cancer by EP4 Activation’ by Majumder M, Landman E, Ling L, Hess D and Lala PK; Molecular Cancer Research. Current Affairs Schulich School of Medicine and Dentistry Monthly Newsletter. August 31, Invited talk, International Conference on Cytopathology, Toronto. February 18, Research highlighted in Breast Cancer Society of Canada and TBCRU blog. December 5, 3 Minute Research Competition.